This map of Titan's surface illustrates the regions that will be imaged by Cassini during the spacecraft's close flyby of Titan on Aug. 22, 2005. At closest approach, the spacecraft is expected to pass approximately 3,800 kilometers (2,360 miles) above the moon's surface. At 5,150 kilometers (3,200 miles) across, Titan is one of the solar system's largest moons. The colored lines delineate the regions that will be imaged at differing resolutions. As Cassini continues its reconnaissance of Titan, maps of this haze-enshrouded world continue to improve. 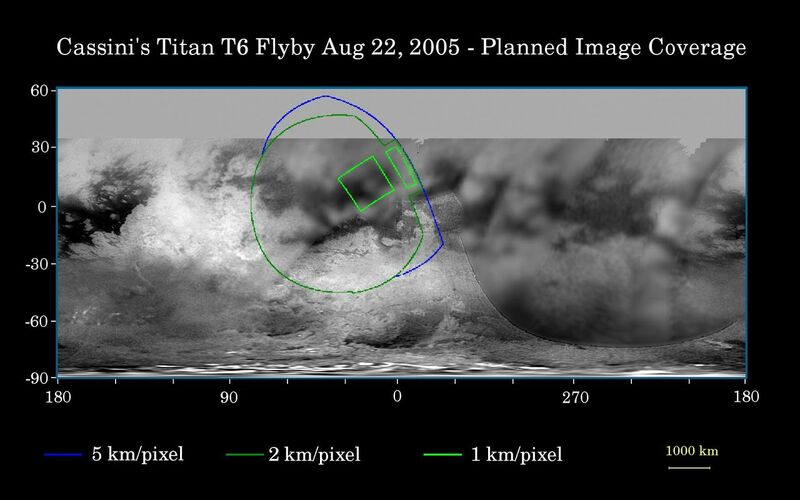 Images from this flyby will sharpen the moderate resolution coverage of terrain on the side of Titan that always faces Saturn. The highest resolution image planned for this encounter will cover a 215-kilometer-wide (134-mile) bright feature provisionally named "Bazaruto Facula." (A facula is the name chosen to denote a bright spot on Titan.) At the center of the facula is an 80-kilometer-wide (50-mile) crater (not yet named), seen by Cassini's radar experiment during a Titan flyby in February 2005 (see PIA07368). The imaging cameras and visual and infrared mapping spectrometer images taken in March and April 2005 also show this crater (see PIA06234). The southernmost corner of the highest resolution (1 kilometer per pixel) frame should also cover the northern portion of a large bright feature provisionally known as "Quivira." Wide-angle images obtained during this flyby should cover much of the Tsegihi-Aztlan-Quivira region (also known as the "H" region) at lower resolution. 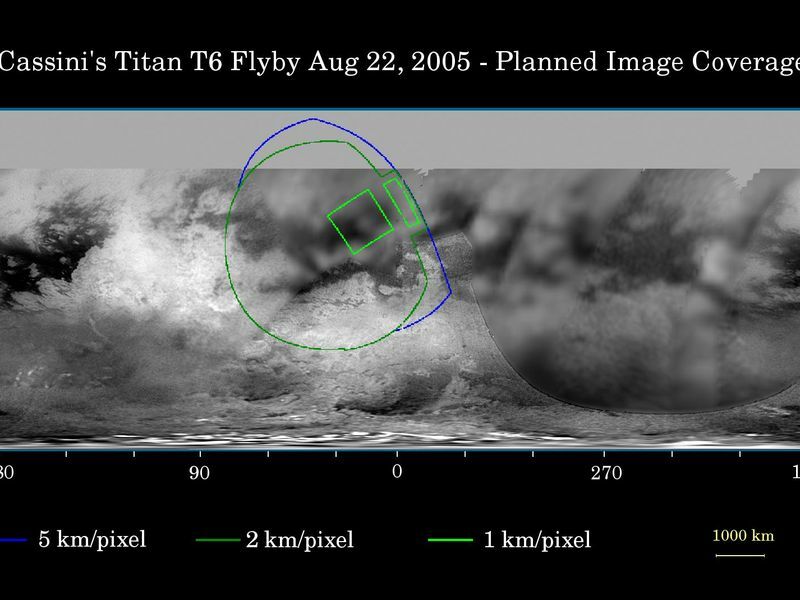 The map shows only brightness variations on Titan's surface (the illumination is such that there are no shadows and no shading from topographic variations). Previous observations indicate that, due to Titan's thick, hazy atmosphere, the sizes of surface features that can be resolved are up to five times larger than the actual pixel scale labeled on the map. The images for this global map were obtained using a narrow-band filter centered at 938 nanometers -- a near-infrared wavelength (invisible to the human eye) at which light can penetrate Titan's atmosphere. The images have been processed to enhance surface details.